The New York Post today posted an article about some recent comments by Congresswoman Ilhan Omar regarding the events of September 11, 2001. Congresswoman Omar recently stated the following in a speech she made at the Council on American-Islamic Relations (CAIR) last month– “CAIR was founded after 9/11 because they recognized that some people did something, and that all of us were starting to lose access to our civil liberties.” First of all, CAIR was founded in 1994–before September 11, 2001. Second of all, CAIR was named as an unindicted co-conspirator in the Holy Land Foundation Trial. That is the trial where the government exhibits include the Muslim Brotherhood’s plan to undermine the government of America. The government exhibits are on line. Please look them up if you haven’t yet looked at them. Meanwhile, The New York Post today posted an article that I believe is the correct answer to Congresswoman’s statement. Now, we have people who were working down there getting sick and dying. It hasn’t ended. Congresswoman Omar owes a lot of people an apology. Unfortunately Congresswoman Omar represents her district. She will probably be in the House of Representatives for a while. This is what happens when immigration without assimilation is allowed. Today is September 10, 2018. Seventeen years ago, it was the day before. We were all going about our business, enjoying a beautiful fall, and making plans for the future. I wonder, if we could have seen into the future, is there anything we would have done differently that day. There was one man who was living in a different world than the rest of us–even on September 10. His name was Rick Rescorla. He was the vice president for security at Morgan Stanley Dean Witter, a brokerage house with 2,700 employees in the World Trade Center in the south tower on floors forty-four through seventy-four and 1,000 employees in Building Five across the plaza. Because of the foresight of this man, Morgan Stanley Dean Witter lost only six employees in the bombing of the World Trade Center. His story is told on his website, RickRescorla.com. I tell this story today for two reasons. First, Rick Rescorla is a hero whose foresight saved many lives. Second, Rick Rescorla understood that there were terrorists who wanted to destroy America even before there was a “war on terror”. We need to think back to September 10, 2001, and remember what our innocence was like and the price we paid for it. Thank God for a man who chose not to be innocent. Most of the information in the above two paragraphs is from the book BREAKDOWN by Bill Gertz (subtitled “How America’s Intelligence Failures Led to September 11”). As we approach the anniversary of September 11, 2001, I wanted to remember that day with something positive. There was a time in 2006 when America and Russia were at least acting like friends. The story below reflects that time. 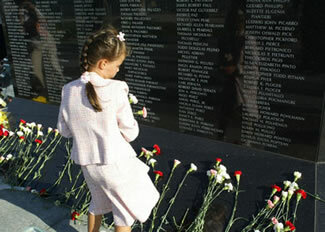 This is a picture of the Teardrop Memorial, Russia’s gift to the United States in memory of 911. 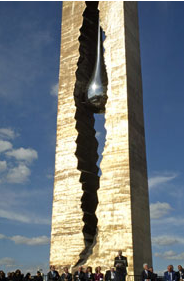 The monument To the Struggle Against World Terrorism was dedicated on September 11, 2006, by President Clinton. It is located in Bayonne, New Jersey, at a place where the twin towers were visible. To read the entire story of the monument and how it came to rest there, please follow the link to 911monument.com. The website tells the story of what inspired the monument and how it came to be. This is another picture of the monument. I stumbled on this monument in an article at the American Thinker. I visited the monument a few years ago. It is a sobering sight. You stand at the foot of the monument and look across the river at lower Manhattan to where the twin towers once stood. Andrew McCarthy posted an article at National Review Online today about the conviction of Sulaiman Abu Ghaith, Osama bin Laden’s confidant, spokesman and son-in-law, of a terrorist conspiracy to kill Americans and providing material support to al Qaeda. It is good news that Abu Ghaith was convicted, but civilian trials for terrorists are not appropriate. The principal problems are that (a) civilian due process requires revealing mounds of intelligence we have about the enemy, which is foolish to do while the war ensues and the enemy’s anti-American operations can still benefit; (b) it is perverse to reward enemy combatants with gold-plated due process once they succeed in mass-murdering Americans when other enemy combatants, who have plotted but not succeeded, are killed by military force with no due process; (c) military commissions are the proper vehicle for dealing with enemy combatants in wartime and they have been authorized by Congress—so enemy combatant terrorists, who defy international human rights norms by targeting civilians, should not be treated as if they were mere criminal defendants; and (d) the strong incentive prosecutors and courts have to withhold some discovery and procedural protections from enemy combatant terrorists—information and protections defendants would get in a normal criminal trial—can set precedents that apply to non-terrorists in ordinary cases, thus diminishing the quality of justice for Americans accused of crimes (i.e., the people for whom due process is actually intended). Abu Ghaith used the same defense as the Blink Sheikh used when he was tried for the first bombing of the World Trade Center–that the jury should understand that his threats and incitements in al Qaeda’s cause were not as co-conspirator statements but as the preachments of a theologian performing the traditional role of an imam. The fact that threats of violence and violence are considered a routine part of an Islamic leader’s role should tell us that Islam is not a religion of peace. Keep in mind that Mohammad divided the earth into two spheres–Dar al-Islam–the land of peace and Dar al-harb–the land of war. Only those lands which are part of the world-wide caliphate under Sharia Law are considered part of Dar al-Islam. The goal is to use all means necessary to bring the entire world into that sphere. That is what we are up against. Even as we focus on budget battles and the problems of the ObamaCare website, there are still other things going on in the world. One of the more disturbing stories to come out this week was about another possible dry run for a future 911-style attack. Yesterday The Week posted an article detailing an internal memo from the U.S. Airline Pilots Association, which warns of “several cases recently…of what appear to be probes, or dry runs” of 911-style attacks. It’s common practice for potential terrorists to carry out dress rehearsals of their planned attacks, and most major terror strikes of the last few decades have involved a dummy-run of some sort. Some have even accidentally involved celebrities. Before al Qaeda terrorists hijacked four commercial planes and crashed them into the World Trade Center, the Pentagon, and a field in western Pennsylvania, killing almost 3,000 people, they carried out a number of dry runs — including one on a flight carrying Oscar-nominated actor James Woods. Four of the future attackers were apparently sitting in first class with Woods on the Boston to Los Angeles flight, and behaved so strangely — sitting erect in their seats and staring ahead for the whole flight — that the veteran Hollywood star called the FBI the day after 9/11 to report his unsettling experience. As long as radical Islamists exist, we will have the threat of terrorism. The hope is that if there ever is another 911-style attack, passengers will react like those on Flight 93 (only this time successfully landing the plane). This is very unsettling news, but hopefully we have learned from past experiences. I live in Massachusetts. Because the planes that were involved in the September 11th attacks came out of Boston, many Massachusetts residents were affected. However, the majority of the casualties on September 11th were New Yorkers, and New York remembers. The Plainview (NY) Patch posted a story this morning about a 9/11 Commemoration Service held at the Good Shepherd Lutheran Church yesterday. The first two pews at the front of the church had been left empty so that the Plainview firefighters could sit there. The firefighters came to mourn fallen comrades and to honor those lost on September 11th. Unfortunately, the service was delayed–the firefighters’ beepers went off as they arrived at the church, and they left to answer the call. The service began about a half-hour later when the firemen returned. When it was over, the community and the firefighters stood outside the sanctuary, shook hands, exchanged words of thanks and went on their way. Not 15 minutes later, distant sirens cut the stillness of the Plainview night. The firemen were still doing their job, even as they mourned the loss of their comrades on September 11th. The legal argument is absurd. American Atheists, which has filed a lawsuit to remove a cross from the new museum at Ground Zero, is making some astonishing claims. The atheists say they are suffering both physical and emotional damages from the existence of the cross. That’s the right. The mere existence of this memorial has brought on headaches, indigestion, even mental pain. They even make a bizarre suggestion about erecting a “17-foot-high A for Atheists” to promote their non-beliefs at the site. These claims are ridiculous. And so is the lawsuit. In just a matter of days, we will be filing a critical amicus brief defending this Ground Zero cross, which consists of two intersecting steel beams that survived the Twin Towers collapse on 9-11. We have a unique opportunity to not only urge the court to reject this flawed lawsuit, but to send a powerful message to the court: that more than 100,000 Americans are standing with us in this brief – urging the court to keep this powerful memorial in place. If you haven’t signed your name yet, there’s still time to do that. Add your name to our brief now. We want to top the 100,000 mark. And we need your help to do it. Add your name here. The National September 11 Memorial & Museum already has filed papers with the court defending the cross. Add your name to our brief defending this Ground Zero cross now. Today’s U.K. Daily Mail posted a story about Haig Melkessetian, a former US intelligence operative, who was an overlooked intelligence resource in the days and years before September 11, 2001. A Christian Lebanese of Armenian descent who has been a naturalised US citizen since 1984, Melkessetian, 49, has revealed his story to the Mail on Sunday for the first time. But inside the secretive community of counterterrorism experts, he has long inspired awe. ‘We see movie characters like James Bond and Jason Bourne, and we assume they’re simply fiction,’ says a former US State Department official who knows Melkessetian well. Mr. Melkessetian was in a position on a number of occasions to gather intelligence that would have been helpful in preventing the hijackings that occurred on September 11. Unfortunately, due to bureaucratic red tape and internal turf wars, his information was never taken seriously or reached the right people. His story is one of a patriot who tried to protect his adopted country. Please follow the link above to read the entire story. It is encouraging to read the story of a man who adopted America as his country because he loved America. It is discouraging to realize that, if taken seriously, his information could have prevented what happened on September 11, 2001. We were young and naïve. We were like children who trust and believe that the world is a safe place. We hadn’t yet grasped the fact that there were people in the world who meant to harm us. But among us were those who were not naïve. Men who understood the threat and tried to warn us and prepare us for what they suspected was coming. One of those men was Rick Rescorla. Rick Rescorla died on September 11, 2001, when the south tower of the World Trade Center collapsed. Scott Johnson at Power Line posted an article today reminding us of the accomplishments of Rick Rescorla. I first wrote about Rick Rescorla in 2003 after finishing James Stewart’s Heart of a Soldier, the book based on Stewart’s New Yorker article “The real heroes are dead.” (“The real heroes are dead” is what Rescorla would say in response to recognition of his heroism on the battlefield in Vietnam.) The book is good, not great, but it touches on profound themes in a thought-provoking way: life and death, love and friendship, heroism and sacrifice, destiny and fate, man’s search for meaning, all fall within the book’s compass. On September 11, 2001, Rick Rescorla was working for Morgan Stanley in the south tower of the World Trade Center. He was head of security for the company and had routinely conducted evacuation drills. On September 11, he led the employees down the tower’s one usable fire escape to safety. He was killed when he went back into the tower looking for stragglers. We need to learn the lesson of September 11. Even when things are peaceful, we need to be aware of the events and people around us. We need to understand that the world is not always welcoming to the principles of freedom and democracy. We need to remember the heroes of that day—there were many—some we know about and some we don’t know about. We honor those heroes by moving forward with the lessons we learned on September 11, 2001. As we approach the tenth anniversary of September 11, 2001, Americans will be bombarded with images, articles, television specials, etc. We need to remember that day and remember the lives that were so tragically cut short that day. There is a website that has collected the television reports from around the world of the events on that day as they unfolded. The website is called “Understanding 9/11: A Television News Archive.” The website is very easy to navigate and very well done. It is sobering to watch the news videos from that day.